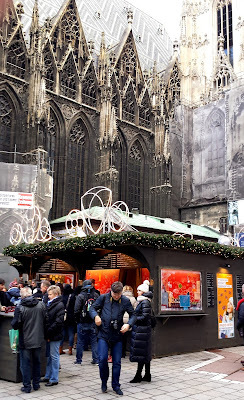 In December 1967, when I was a student in Vienna, I stumbled one cold December day on the city’s Christkindlmarkt (literally, Christ Child Market) located in an alley at the end of Mariahilferstrasse in the back of a large complex known as the Messepalast. 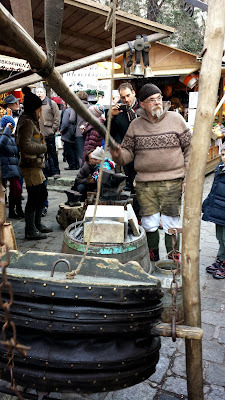 The market was a modest grouping of wooden stands selling crafts, toys, food, beer, trinkets, and hot wine. Its location was a good one, near a major shopping street and across a busy road from the Art History and Natural History museums. From 1958 until 1975, the market set up behind the Messepalast, which was reconfigured in the middle 70s as the Museumquartier. That was where I visited this market in 1967 and later in 1971, when I was again studying in Vienna. That site because unusable in 1975 when construction began on underground parking at its location. 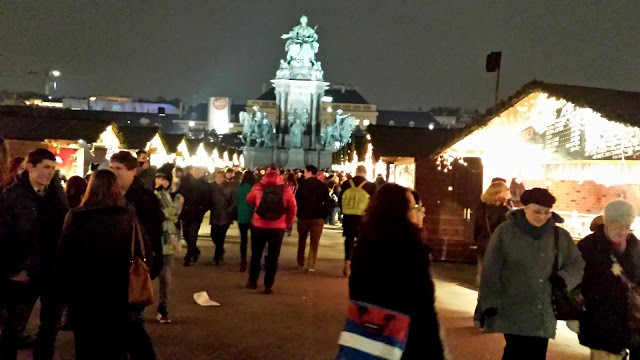 That year, the city’s Christkindlmarkt moved to the large plaza in front of Vienna’s monumental Rathaus (city hall), located on the Ringstrasse between the Austrian Parliament building and the main building of University of University. 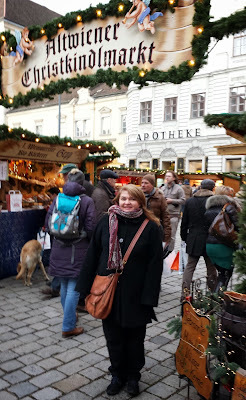 I am not sure when other Christmas Markets, also called Advent Markets and Christmas Villages, opened in Vienna. 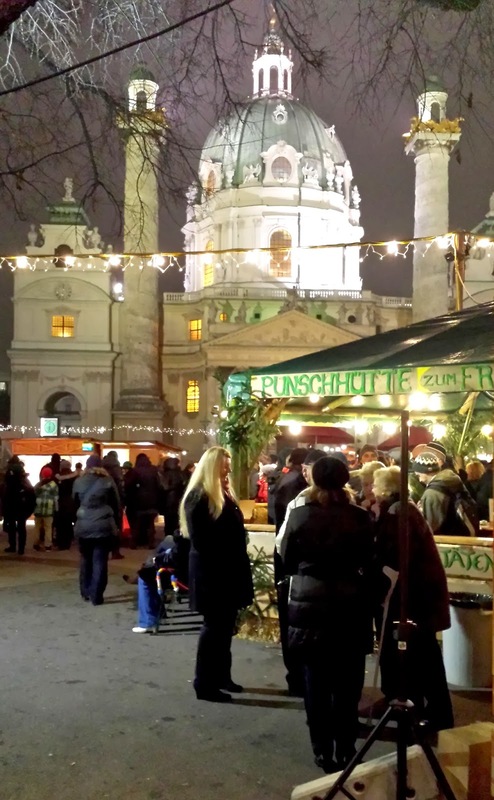 However, 2013 was advertised as the 27th anniversary of the Christmas Market at Freyung and the twentieth anniversary of the Christmas markets in front of Karlskirche (Charles Church) and the awe-inspiring Schönbrunn Palace, the summer residence of the Hapsburg monarchs. Likely, the Freyung market was the first established to supplement the main Christkindlmarkt at the Rathaus. If so, the number of markets in Vienna began increasing around 1986, with two more added in 1993. The number of Christmas Markets has increased since then, as has the number of people visiting them. In 2013, a new Christmas Market was opened alongside St. Stephens Church (which had been the site of the Market from 1924 to 1928 and again in 1943). This location near the intersection of Kärtnerstrasse and the Graben is one of the busiest in the city. 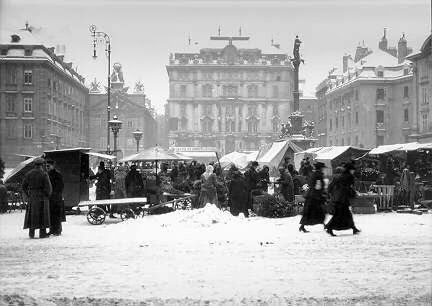 After visiting the 1971 Vienna Christmas Market, I did not return to the city in December until 2000; after that I was in Vienna in December, at least briefly, for seven years in a row. Also, I was also there briefly in December 2011. Each of these years, I visited the Christmas markets to enjoy the festive lighting and jovial spirit in some spectacular settings. There is something innately enjoyable in standing outside in the cold, sipping glühwein or hot punsch, hearing happy voices and glancing around at impressive, historic buildings and at dozens of small colorful booths selling all kinds of food and crafts. Returning this year for a couple of weeks, I visited all of the full-time Christmas markets, except one. Also, I missed the “medieval Christmas market” held one November weekend at the Arsenal building where the city’s War History Museum is located. Beyond that, I did not make it to some of the neighborhood markets that were held various weekends. This small market is located in a public square a couple of blocks from Schottentor, which is a main transportation hub. This market is a small one, limited by the size of the square. Its size and stability (the same people seem to return with their booths every year) make it more intimate that other markets. In many ways, it reminds me of the Vienna Christkindlmarkt in 1967 and 1971, when it was more modest in size and setting. 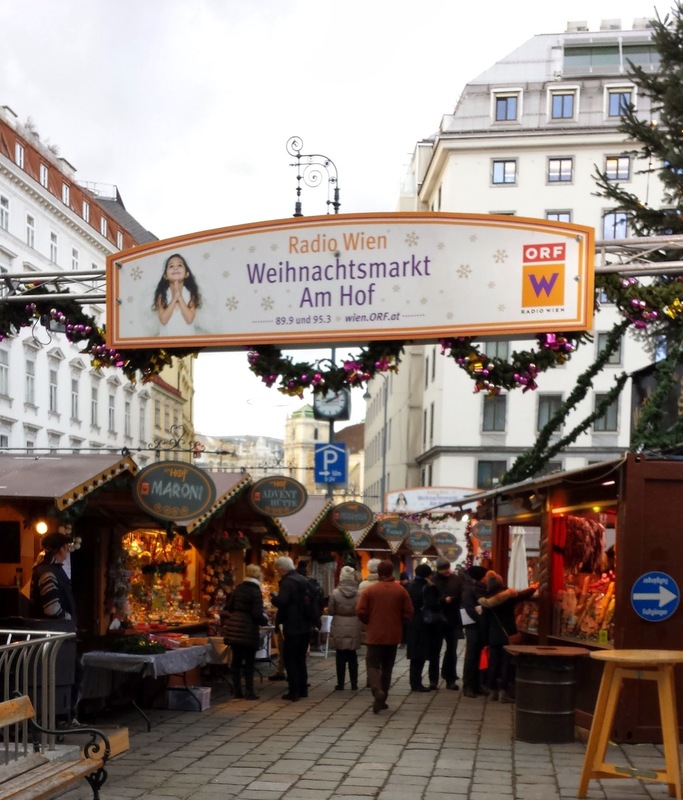 In recent years, another small Christmas market has been operating across the narrow Freyung street. 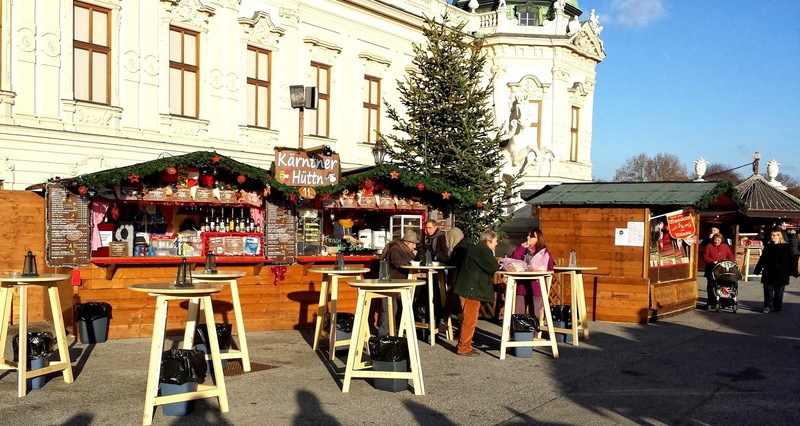 Its booths are set up on the large sidewalk in front of a huge building lying between Freyung and Herrengasse. This market is the Biobauern market, which sells organic and ecologically friendly foods and good. Ranking this market as my favorite, I should disclose that I am predisposed to like the Old Vienna market because in Spring 1968 I attended Institute of European Studies classes in the Kinsky Palace, which lies a few steps from this market. Thus, I had occasion to be in this vicinity almost daily for about four months and it retains good memories. This Christmas market is the opposite of the Old Vienna Christmas Market in scale and grandeur. Its setting is spectacular and the lights and decorations are the best among the markets. Not only are the soaring spires of the city hall nicely lit, but also the parks on either side of the square have colorful and attractive Christmas decorations. This year, this market had 150 stands selling different drinks, food, crafts, and doodads. Every time I was there, the market was stuffed full of people. The density was especially great at night and on weekends. This Market, the original one, is a “can’t miss” attraction; however unless a person likes large crowds, he or she likely will come to take a few pictures, grab a Christmas punch (the mugs are usually nice collectibles), and then find another market that is less hectic to enjoy at leisure. The market was open in 2013 from 10 a.m. to 9:30 p.m., except on Friday and Saturday when it stayed open until 10 p.m. It is located on Ringstrasse between the Parliament Building and the main building of Vienna University. I especially liked visiting this Christmas Market during the day, though I also had to come in the evening to take pictures. The palace is a huge renaissance building suitable in scale and grandeur for the ruler of a huge empire. In fact, it was built as the summer home for the Hapsburg emperor. 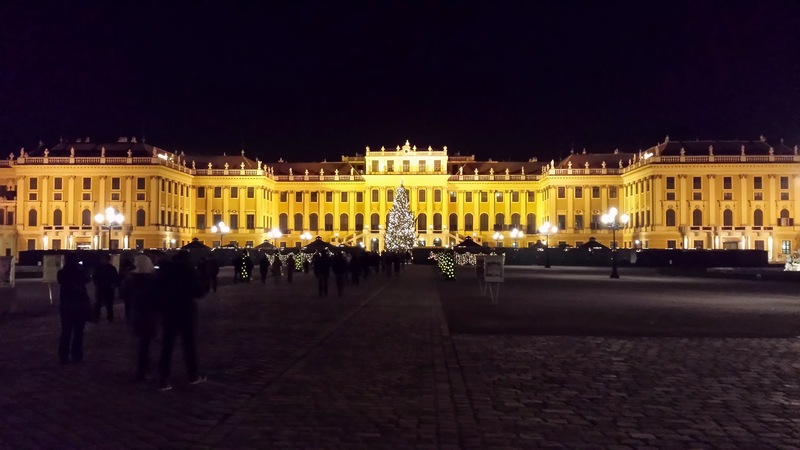 The expansive Hapsburg-yellow façade of the palace provides a great backdrop for what seems to be a small village of modest wooden stands offering hot wine, sweets, and crafts. The food selection at this Christmas Market seems a bit better than many of the other markets, and the most of the crafts were of high quality. Although lots of people came to this market, it did not feel nearly as crowded as the Rathaus market. If you come during the day, you can stroll around the extensive grounds of the palace and even walk up to the Schönbrunn Gloriette to get a nice view of the city. In 2013, this Christmas market was open from 10 a.m. to 9 p.m. daily. 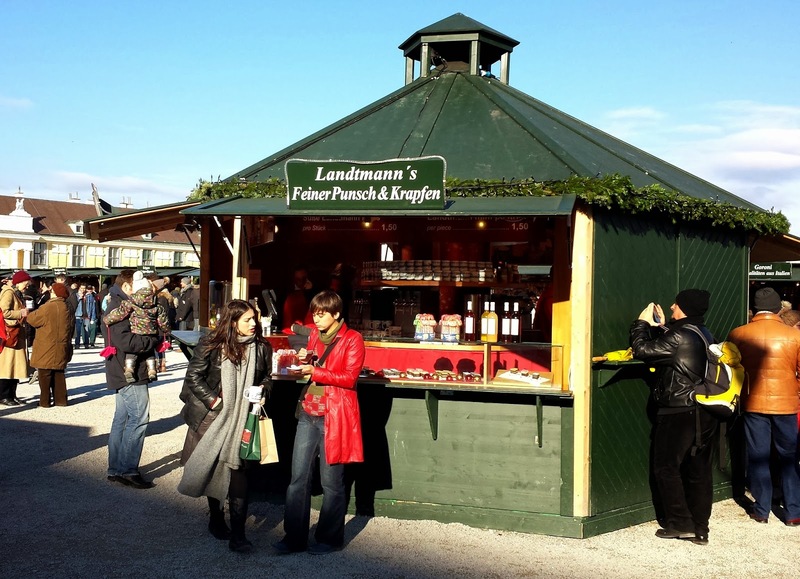 It is one of two Christmas markets that remained open on December 25 and 26th (from 10 am to 7 pm). Also, beginning on December 27, the site hosted a New Year’s Market (10 am to 7 pm) that lasted until January 1st. 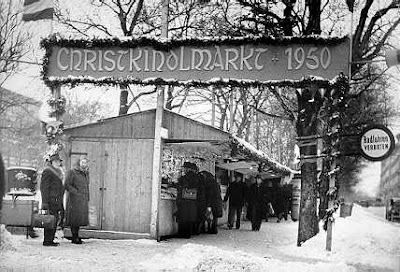 The Spittelberg Christmas Market is not too far from where the Christkindlmarkt was located in 1967 and 1971. It can be found a couple of blocks behind the Museumquartier between Siebensterngasse and Burggasse. The market can be reached by walking up Burggasse from the Volkstheater or by taking Strassenbahn 49, one stop from the Volkstheater. This 7th district market is another change of pace from the monumental markets at the Rathaus and Schönbrunn. Most of its stands are located along two narrow streets (Spittelgasse and Schrankgasse, with some spillover on Spitalgasse). The Spittelberg area contains many traditional and funky craft shops and several small restaurants. So, many of the stands have handmade goods, and several restaurants are available near the market stands. For me, this market captures some of the late 1960s and early 1970s feel. It is a comfortable place to drink some punsch and peruse crafts in a friendly setting. This market had the misfortune in 2013 (as well as in 2012 and 2011) to be located amid much construction that obscured its setting which includes the Am Hof Church, a large statute of Mary, and the old Vienna Firehouse. 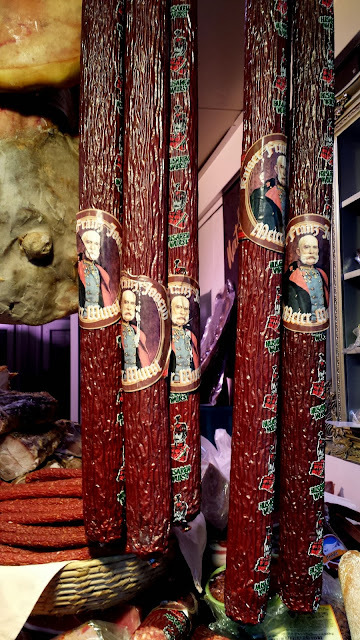 Nevertheless, it distinguished itself by having vendors selling things seldom found at other locations, including an excellent stand selling meats from throughout Austria and several selling antiques. This market had stands selling several different types of food, so it is a good place to each lunch or a snack. I have to admit that I ranked this Christmas Market higher than the others that follow not only because of its impressive offerings, but also because it is part of my old neighborhood. In the 1966-67 academic year, I lived a block away on Parisergasse, and I have strong nostalgic feelings about Am Hof that likely biased me toward a higher ranking. Am Hof is located two blocks toward the inner city from the Old Vienna Christmas Market at Freyung. If you visit one of them, it is easy to visit the other. This 9th district market is located in the huge inner courtyard of what used to be Vienna’s main hospital; the buildings are now used by the University of Vienna for various institutes and administrative offices. Because the court yard is expansive, this market has substantial space to host its stands: they are located along meandering paths amid trees and shrubs in a nicely landscaped setting. The large area allows the market to set up tables where visitors have ample room to stand and sip hot wine without bumping up against someone else. In all, it is a nice place for a leisurely visit. The market has a large number of stands with the usual drinks, food, crafts, and crap. It also has some children’s rides. At night, the market is reasonable well lit, but lacks the brightly colorful setting of some of the better markets and the funky feel of others. Nevertheless, it is worth a visit. This market is another one with a notable setting: a huge church that has two soaring minaret-like columns in front of it. In 2013, Charles Church had a big antiabortion banner attached to its front, forming part of the setting for the market. 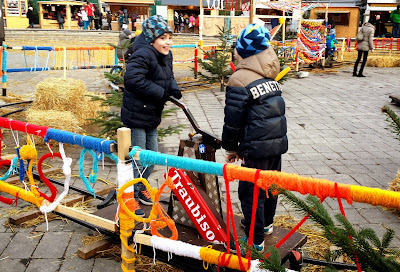 The location of this Christmas Market is next to a large children’s playground. Also, it turns a huge fountain in front of the Church into a barnyard that covered with straw and housing some animals – such as goats -- for viewing by children. Near the barn yard are some low-tech kid’s rides and a place to ride ponies. All of this makes the Karlsplatz Christmas Market the best one for children to visit, and many are there in the afternoons. The market also offers adults a good selection of booths, several with quality crafts. It also has many places to buy punsch and various specialty foods. Crowded at night, I did not find the layout or the lighting of the market to be attractive. It seemed dimly lit and the atmosphere was not particularly enticing. The market was good for a short visit, but I did not want to hang around too long. This market is located around a large statue of Maria Theresa that stands between two large museums, the Museum of Art History and the Museum of Natural History. On her perch, Maria Theresa faces Heldenplatz and the Hofburg, the complex that housed the Hapsburg monarchy. This market is one of the newer ones. It is also one of the smaller ones, but also seemed to be a favorite of visitors who arrived in the dozens of tour buses that parked on the streets around the museums. With so many busloads of tourists, the market often seemed tightly packed during the day, especially on weekends. The setting is pleasant, though the lighting is somewhat dim. The market has the usual array of stands selling the usual stuff. Nothing really distinguished it from the other markets, except this year, a huge banner hanging from the entrance of the Art History Museum was a bit jarring. 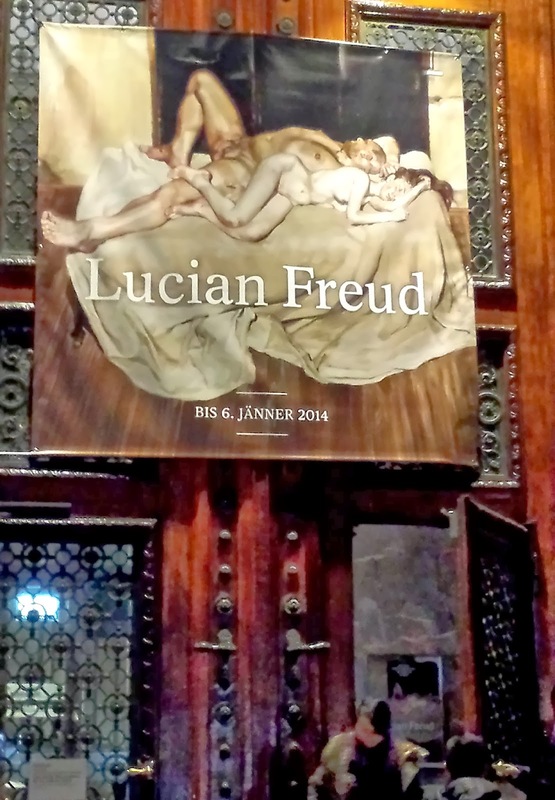 It advertised an exhibition of paintings by Lucian Freud at the museum, showing one of his paintings. In this one, a not particularly attractive couple is lying naked in bed together. The painting is graphic and puzzling – if you look closely enough, and provided one of the stranger backgrounds for the Christmas markets. When I saw the blown-up painting, it occurred to me that it is fortunate that Maria Theresa -- a bit of a prude in her time -- looks forward toward the Ringstrasse rather than at the museum. She likely would be shocked by what she saw to her right. 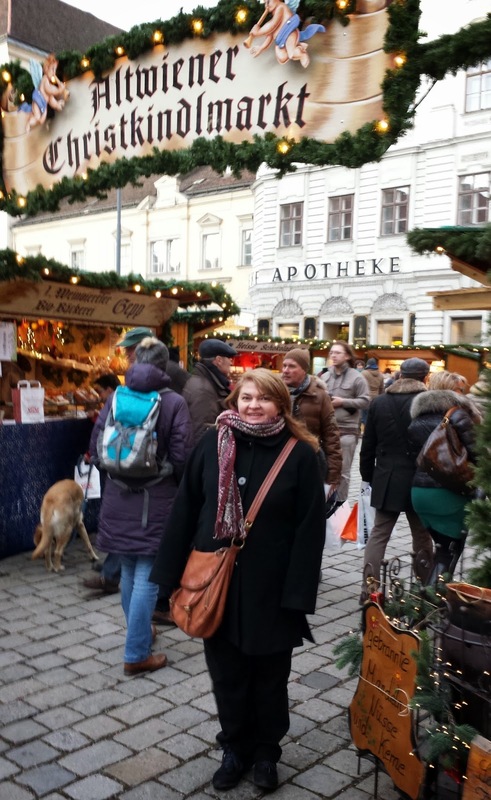 This Christmas Market is located in front of another Hapsburg palace, though it is not nearly as impressive as Schönbrunn. The location faces a large reflecting pool. In the old days, the South Train station lay across the street from the pool. In the past decade, the South Train station has been demolished and new high rises are being built where it stood. The back side of Belvedere is more impressive than the front, where the Market is located. The back faces a long garden that gently slopes down a hill. It offers a great view of the spires of St. Stephens and of Leopoldsberg and Kahlenberg, the mountains on the northern edge of Vienna. This market is a bit smallish, and I am not sure it has much to distinguish it from the others. It does have a couple of rides for children. This Christmas Market opened for the first time this year. Its location insured that lots of people would visit it: It was situated next to St Stephens, a major Vienna landmark and attraction, near the intersection of Kärtnerstrasse and the Graben. These two pedestrian-only streets are always crowded, and on weekends are clogged with tourists. The market seems to be a pleasant, albeit small, one. The ancient church, visible from throughout the city, provides an impressive background. Nevertheless, the crowds were so dense that I did not want to spend much time there. All of these markets that I have ranked are open every day for about five weeks. In 2013, the markets opened on November 16 and most closed on December 24th. As shown, two of them were open on December 25 and 26. 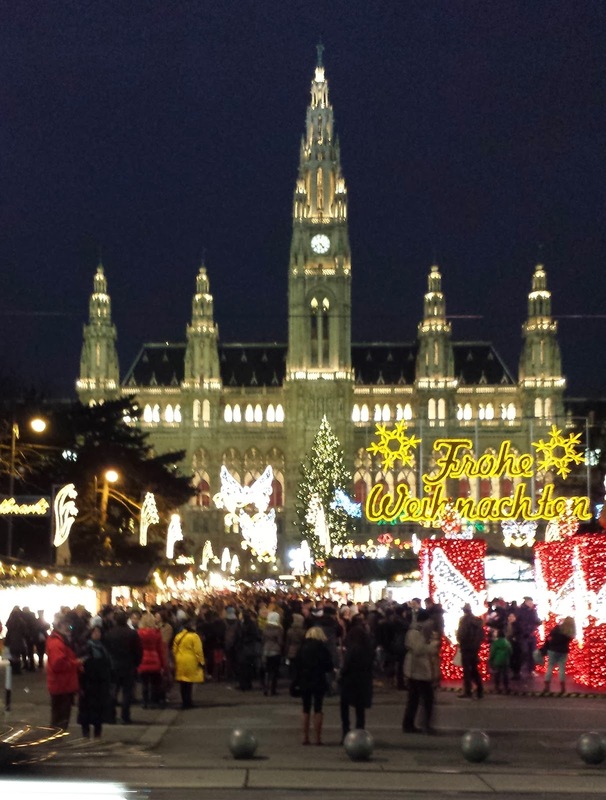 In late November and early December, it gets dark in Vienna by 4:30 p.m., so it is possible to see the lighted Christmas Markets in the late afternoon as well in the evening. Since most close at 8 p.m. or later, it is easy to visit several in one evening, if so desired. The Markets have food that is great for snacks, but it is sometimes hard to find food that is sufficient for a meal. A few markets have food specialties from different Austrian provinces; they are worth sampling. Several booths cater nicely to people with a sweet tooth who want a snack. The hot wine drinks come in many different varieties. 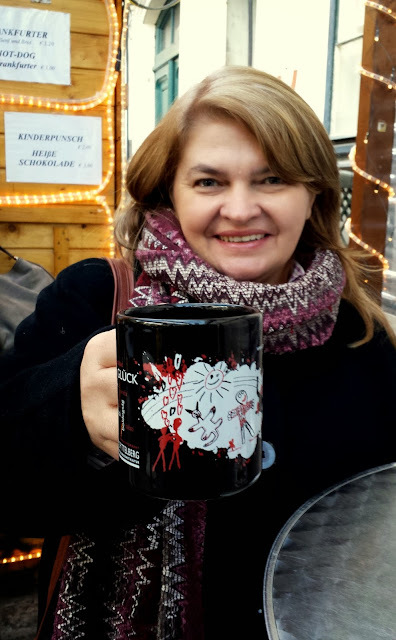 I like glühwein, which is a traditional hot mulled wine. For people who want to try different things, the punsch comes in dozens of tastes, flavored with different kinds of fruit and seasonings (stands selling punsch seem to have some contest going to see which one can concoct the most esoteric punch flavor). My favorite, which I had at the 2013 Market at the Rathaus, is the Christmas punch, which had no particular fruit flavor but was similar to Glühwein. I don’t think you can go wrong with any punsch if you choose a flavor (e.g., orange, apple, pear) you like. 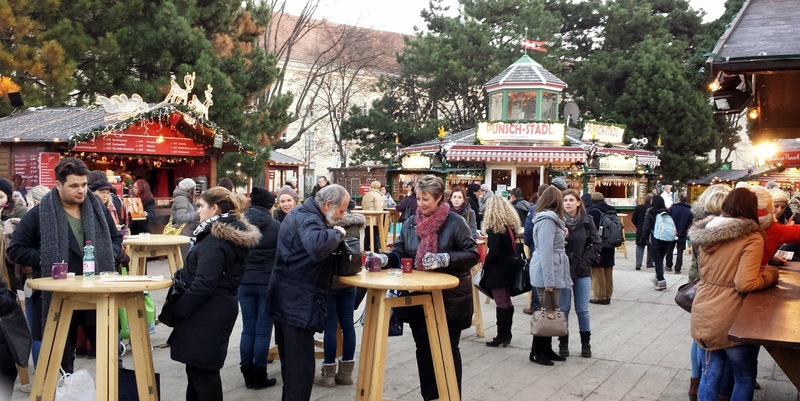 In 2013, a glühwein or punsch cost between 2.80 and 4 euros. The average was 3.50 euro. The prices vary by location with the highest prices at the most popular locations, such as the Rathaus. The drink is served in a mug that looks like a coffee cup. It holds one-fourth of a liter (a “viertal”). You have to pay a deposit for the cup (2 or 2.5 euro in 2013) or give up an empty one for a filled one. When finished for the evening, you can return the empty cup to get your deposit returned, or, of course, you can keep the cup if you want. Each market has a cup designed especially for it. Most are pretty nifty, and I have a small collection of them. Vienna’s Christmas Markets provide some memorable experiences. I hope you can visit one in 2014.